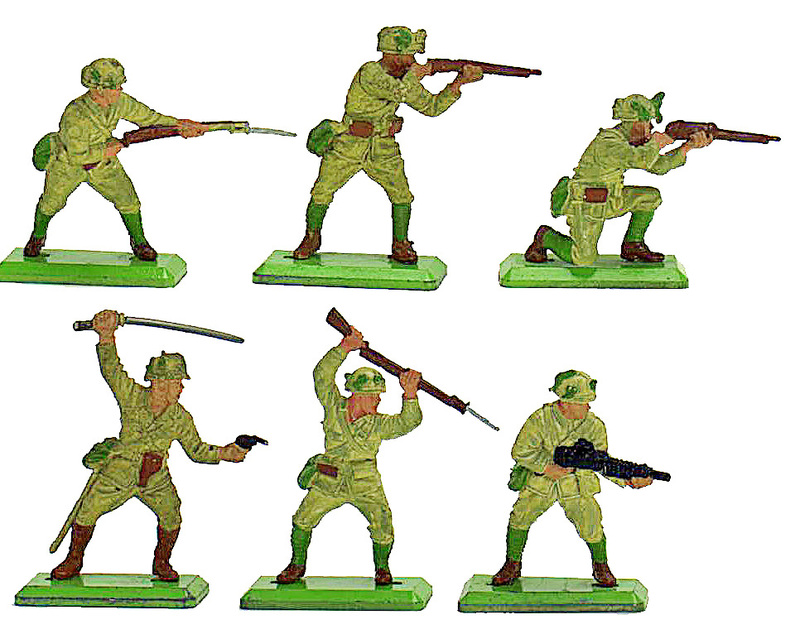 When it comes to acquiring toy soldiers, many devoted hobbyists choose plastic figures, or a combination of plastic and metal models, to build their collections. I am one of the latter, having purchased painted and unpainted plastics, as well as painted metals, since a tender age. In the plastic field, hundreds of international makers produced figures and accessories in the past seven decades. But only four manufacturers have continued to command the lion’s share of collectors’ attention. Marx has always been the most popular among American hobbyists, while the British companies, Airfix and Timpo, also have their devotees here and abroad, but Britains, and most specifically their Deetail range, holds the dominant place in the hearts of serious plastics collectors worldwide. 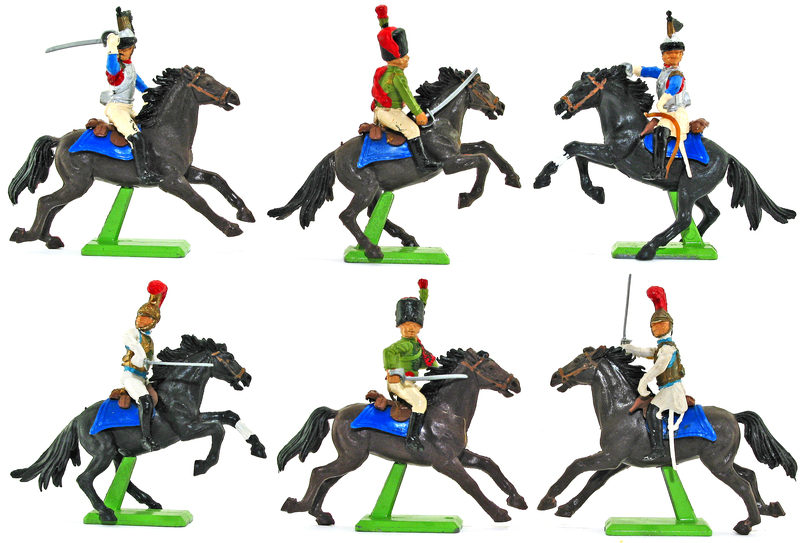 Their superb sculpting, evidenced by such popular sets as their 7th Cavalry and Napoleonic ranges (shown above) outshines all but the very best metal figures. 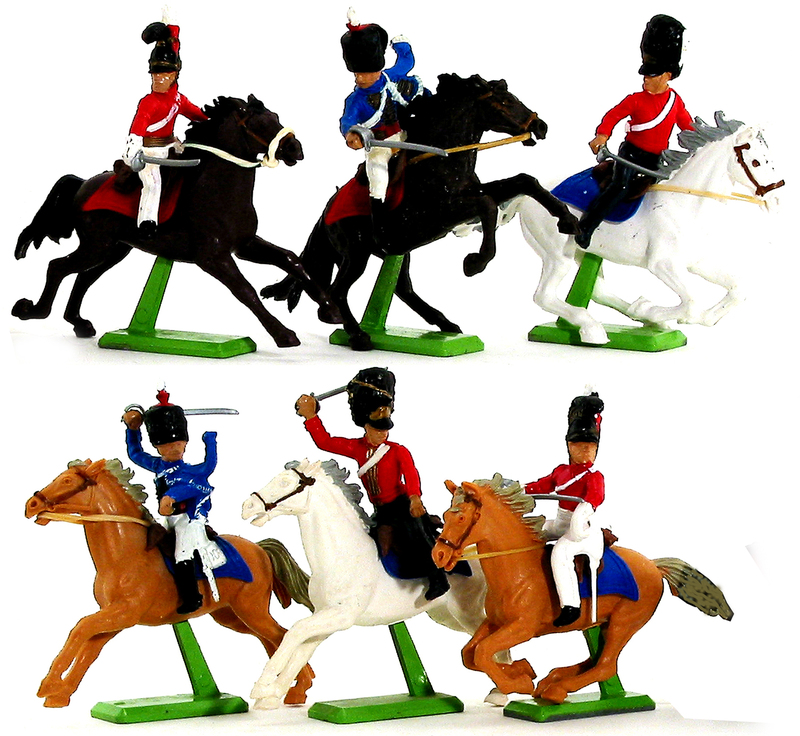 Britains has produced plastic figures since 1952. Their original range, Herald, was followed by the Eyes Right and Swoppet lines. In 1971 the Deetail range was introduced, and over the past 4 decades it has covered such widely divergent historical subjects as the Middle Ages, The American Civil War, The Foreign Legion’s conflict against the Arabs, the Wild West, World War II and Modern Armies, as well as a huge farm and civilian series. As you can see in these photos, the style and quality of their paint jobs have changed in succeeding versions over the past 4 decades, and some of the sculpting has been altered or redone entirely. 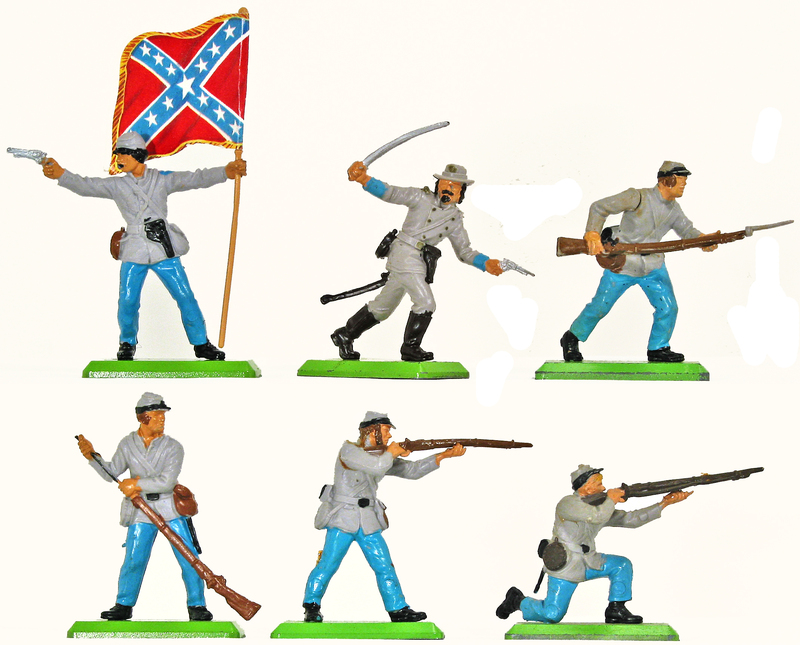 For instance, in the photo shown above of the first version of their Civil War Confederate infantry, 3 of the poses (advancing, standing and kneeling firing) are unique to this version. 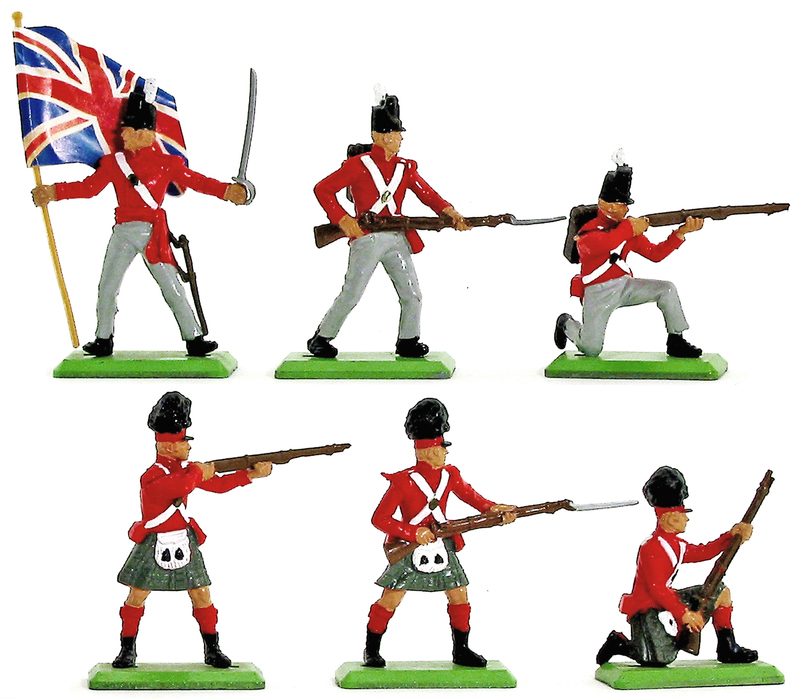 The rifles are longer and have detailed straps, while the advancing figure’s rifle sports a bayonet. Released in 1971 these 3 unique poses were made with plug arms. In 1981, these 3 poses were replaced with newly-sculpted fixed-arm versions, each a one-piece casting (seen in the other photo above). 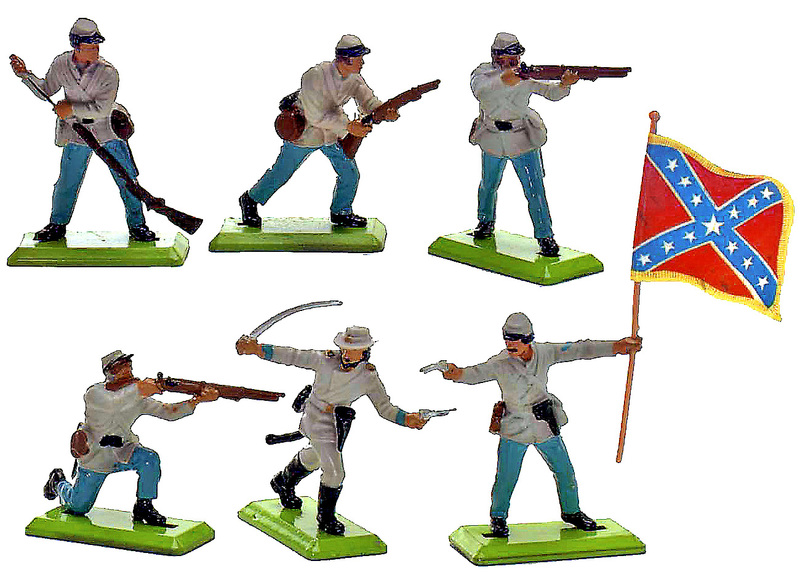 In the 1st and 2nd and all subsequent versions, the sculpts of the flag bearer, officer and loading poses remained the same. Because the Deetail range contains hundreds of sets and accessories which span the past 40 years of the Britains catalog, it would be best to narrow down one’s choices when beginning a collection. If money is no object, you can make it your focus to acquire only the rarest sets, or purchase only mint-in-box sets. Above you can see the set commonly referred to as “The Holy Grail.” This is a group of 4 Super Deetail Modern British Paratroopers. Super Deetail figures were produced by fusing together pieces cast in different colors of unpainted plastic to make highly detailed models which appeared to be painted. These 4 figures were produced in extremely limited numbers in 1978, but were never generally released to the market. It is estimated that fewer than 1000 of them were ever made. Some entire ranges were released for only very brief periods. 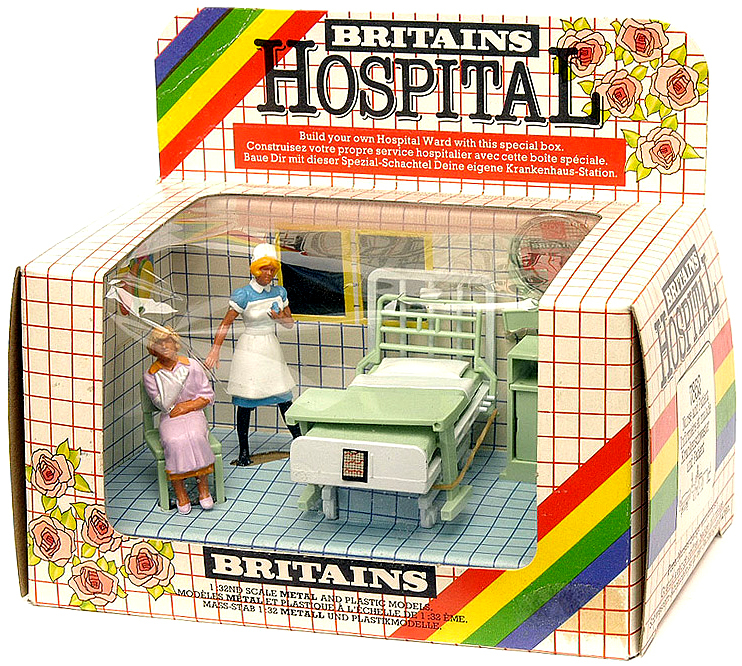 One of the most sought-after such series is represented by this next photo, a mint-boxed set from the short-lived Britains hospital range. 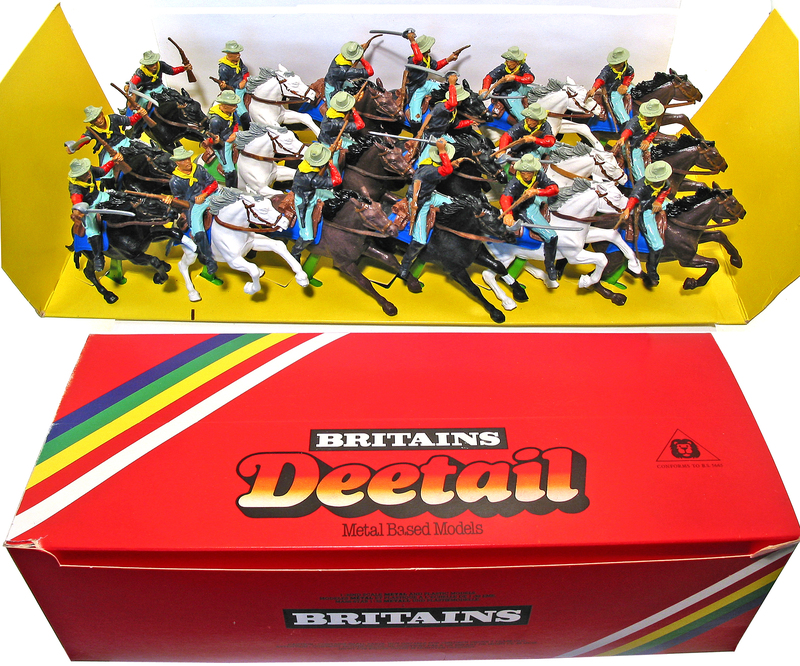 This Super Deetail series was released in 1983, enlarged in 1984, reduced in size in 1985 and discontinued by 1986. Accessories were of painted metal and unpainted plastic. Another collecting option is the purchase of Britains’ ‘counterpacks.’ While window-box sets were meant for display on the shelf, Britains issued counter packs for point-of-sale placement on the checkout counter. Figures in these bulk-packed sets would be sold by the piece, then the empty box would be discarded. 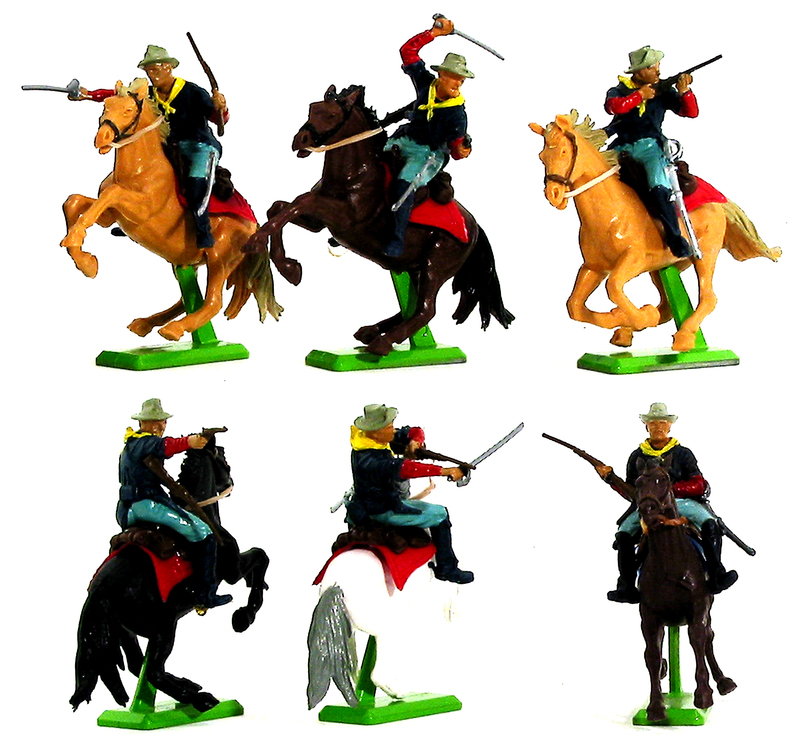 This 1st version set of 7th Cavalry was released in 1978, so finding it in its original box is a difficult proposition. They rarely come up on Ebay or at auction houses. Other routes to collecting include picking an historical era and purchasing only sets produced within its parameters. 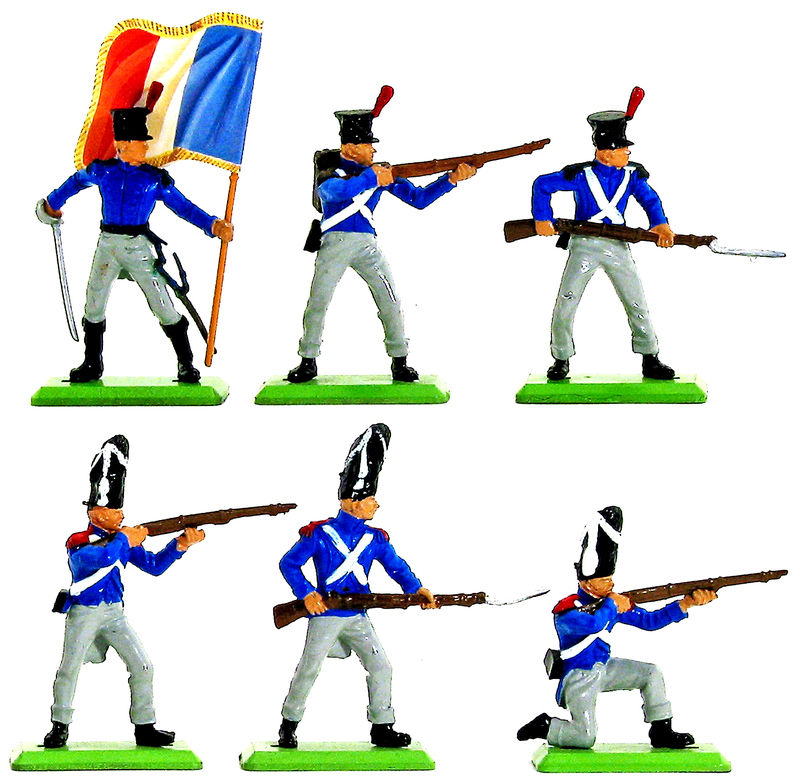 Such would be the case with the 3 sets shown above, which are the only other sets in the Deetail range devoted to the Napoleonic Wars. Some go the route of becoming Deetail “completists,” whose goal it is to purchase one of every figure or boxed set in the range. Then there are war gamers, who prefer to buy the same sets over and over again to build their armies. Another hobby approach is taken by diorama builders, who try to stockpile multiples of specific poses from one or more ranges to create their miniature scenes. For 40 years Deetail figures have proven themselves to be consistently popular among hobbyists of all ages. A beginner can still cut his teeth on one range or other of the current Super Deetail models. The “Super Deetail” moniker may cause a little confusion, as the original models under this name were the fused-together style of unpainted plastic, while the current use is entirely different. As of 2006, the term Super Deetail describes the paint style which the current owner, First Gear, applies to their models. These figures are painted in their entirety, rather than in the tradition Deetail style, in which just the details were painted on. 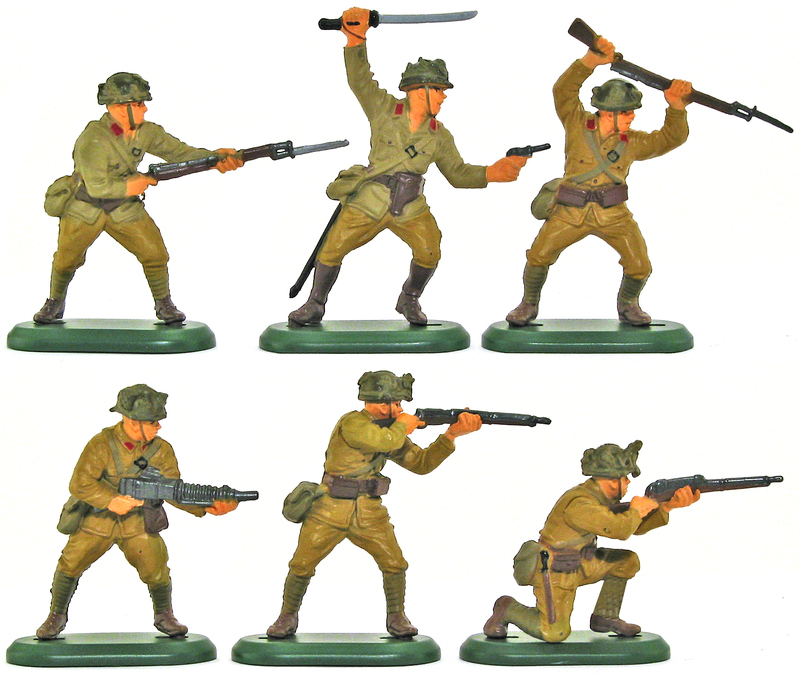 Shown above is one of this current range, the 3rd version Deetail WWII Japanese Infantry. This set is better, and more authentically, painted then the 1st version original, which is shown just below it. In the 1st version, the figures were fully painted, which showed off one of Britains’ most well-sculpted efforts. Produced in 1973 for one year, then replaced with 2nd version in the more traditional Deetail paint job in 1974, the set was retired in 1976. But First Gear reissued them in 2006 and they are readily available in many toy and hobby shops, as well as on line. 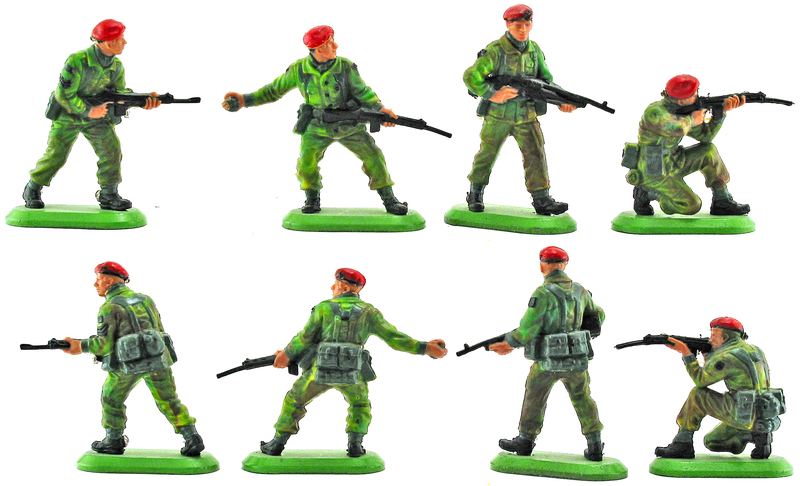 In Part II of this post, I’ll offer advice on how to acquire retired Britains Deetail figures, as well as display advice, wargaming suggestions and an explanation of terms regarding condition of figures.